Another batch of rye miso. The 2 on the left are from today made with dark rye koji. The ones on the right I made a few days ago with light rye koji. 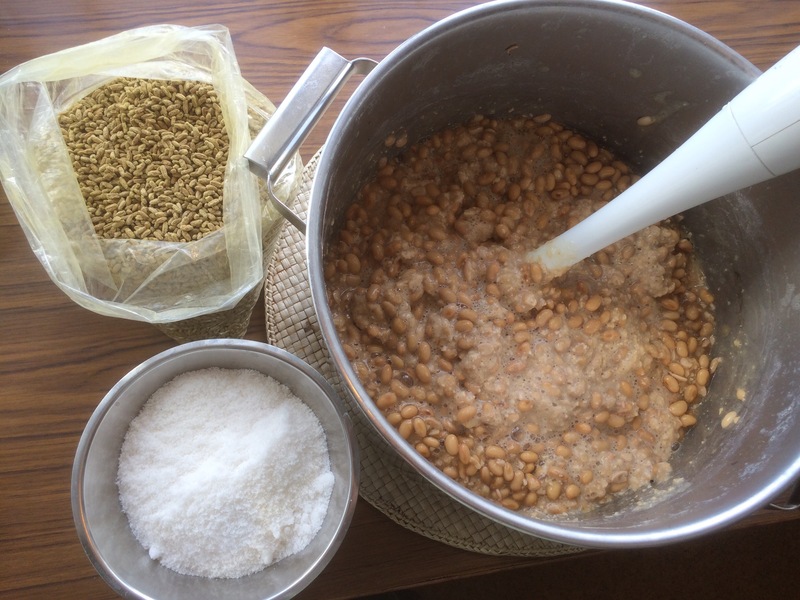 The light koji is made with starter from Higuchi Shoten Japan, and the darker with starter from Gem Cultures USA. It will be interesting to see how they progress and taste 2 years from now and to compare this with a similar test I set up earlier last spring with 2 batches of barley miso. While recuperating I can continue making miso. Today it’s a rye miso made with light rye koji. There is still some koji from last spring, but soon I’ll get into making this years koji. My first batch of light rye koji was dried and ready to use, so I boiled a kilo of french eco soybeans. This time I’m using the rye koji made with Higuchi yellow barley tane koji. The next batch will be with the one from Gem Cultures. 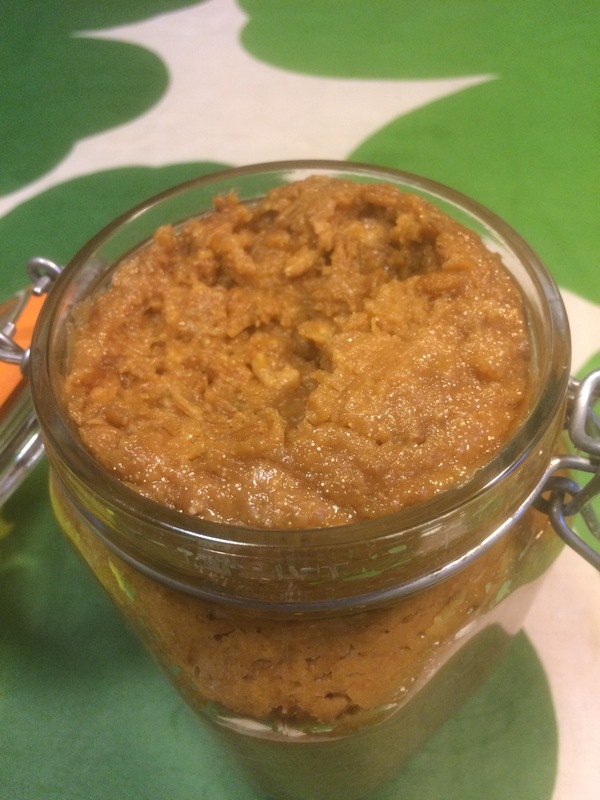 I’m using the standard 2 year miso recipe. At about this time last year I got the idea of trying rye for koji making. 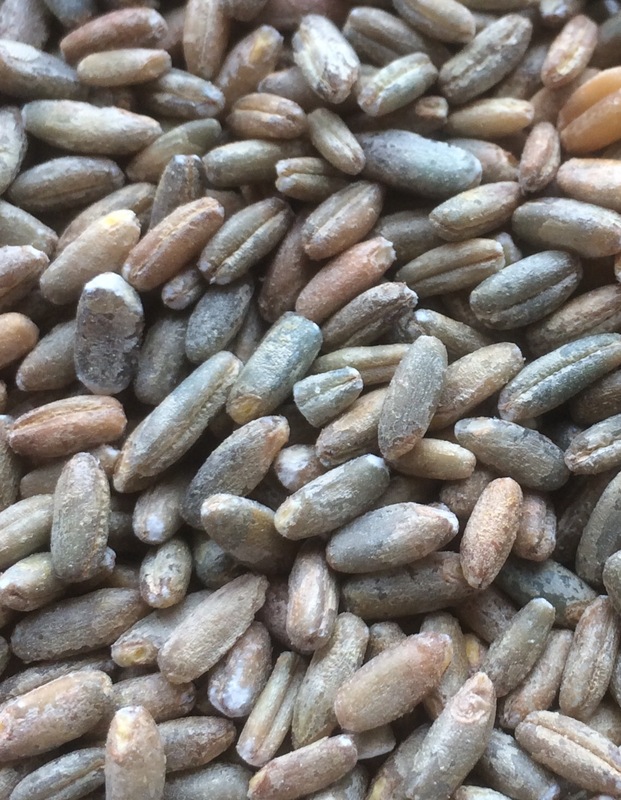 I had my grain farmer run the rye grains through the husking machine he uses for barley. It worked fine, so I made 3 batches of rye miso. The first one, a 6 month miso, was good and now long eaten up. The second, a 1 year miso is now open and it is great. It has a flavor of it’s own. There is a 2 year miso too, to open next year. In the mean time I must get busy and make more rye koji and rye miso. 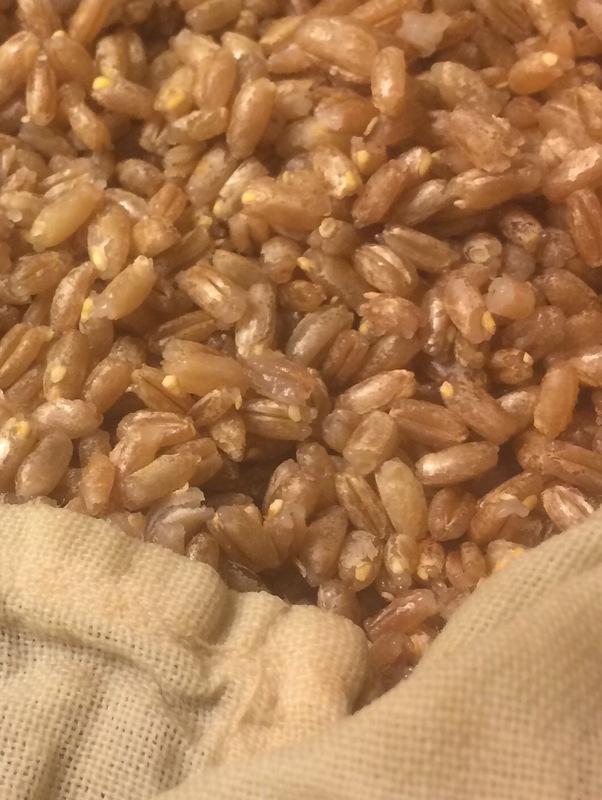 I’ll make some with the other barley tane koji too – and a couple batches of 2 year rye miso. 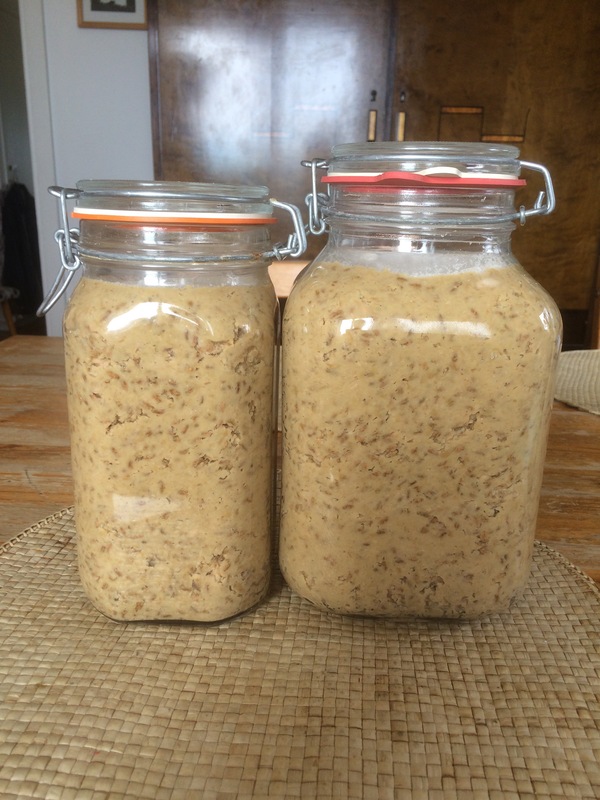 It’s gone about 6 months since I made my first ever rye miso. 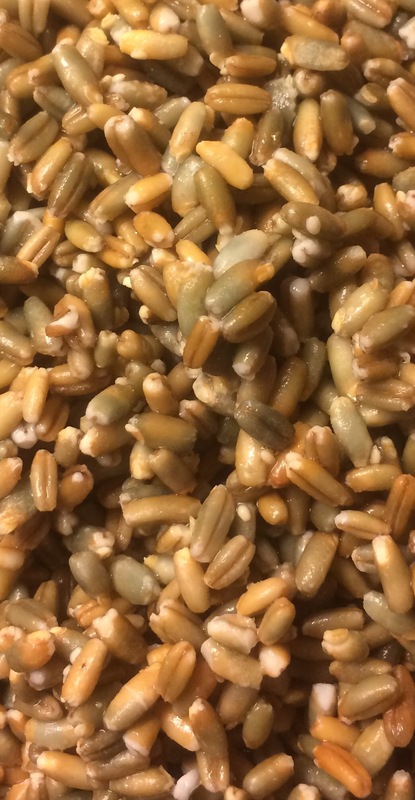 One batch was a sweet miso – more rye koji, less salt and less time. I have opened it and tasted it. And made a vegetable soup with it. Nice color and smell. 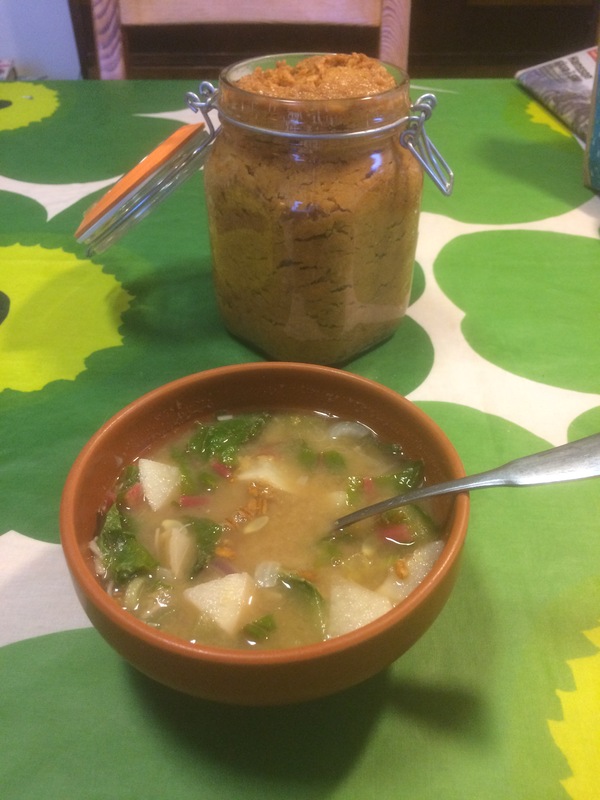 It was, of course, a bit weak because of the short fermentaion time, but very tasty. It had the sweet-sour flavor of a good sweet miso, and the umame effect was great. 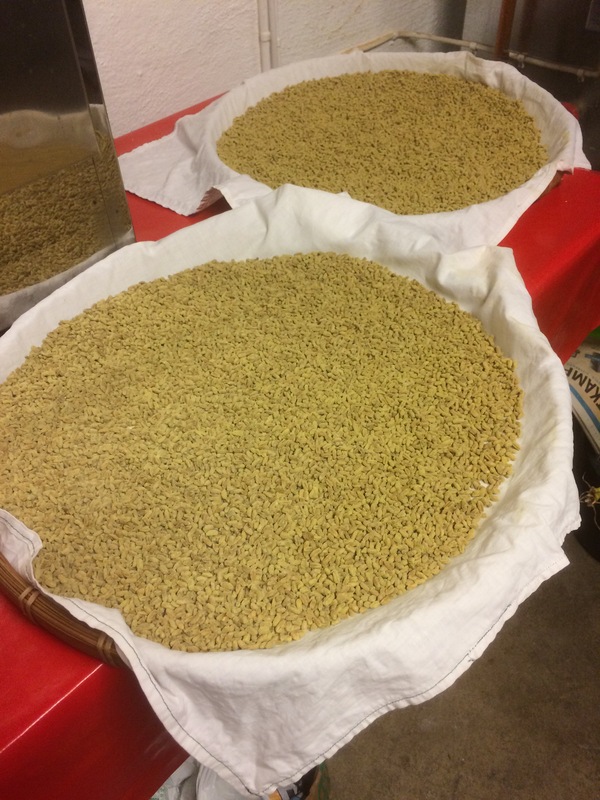 Ot will be interesting to see and taste the development of the 1 year and 2 year miso versions. When the time comes. This time the beans got cooked right. And the result was perfect – so far. 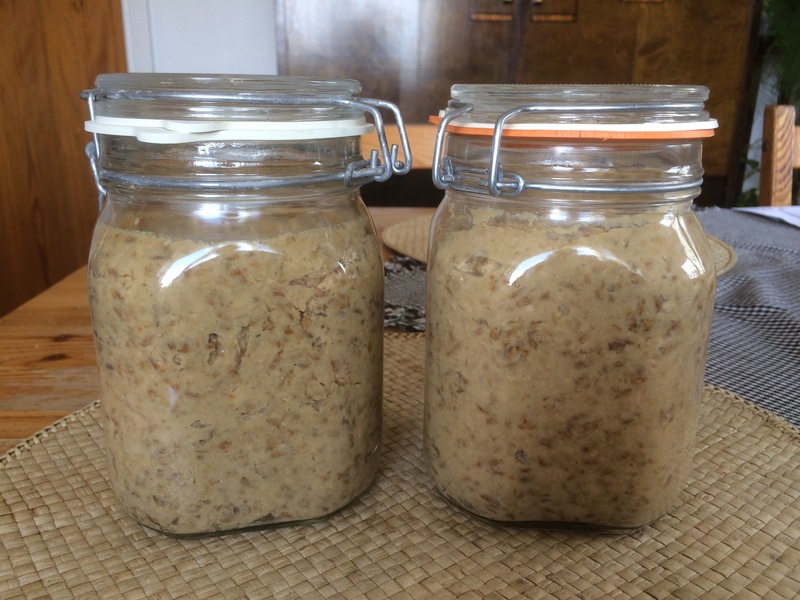 One jar of 6 month rye miso and the other jar of 1 year rye miso. I had 600 grams of rye koji which I divided into 3 parcels of 200 grams each, 1 for later use to test rye amazake and 2 for quick miso. 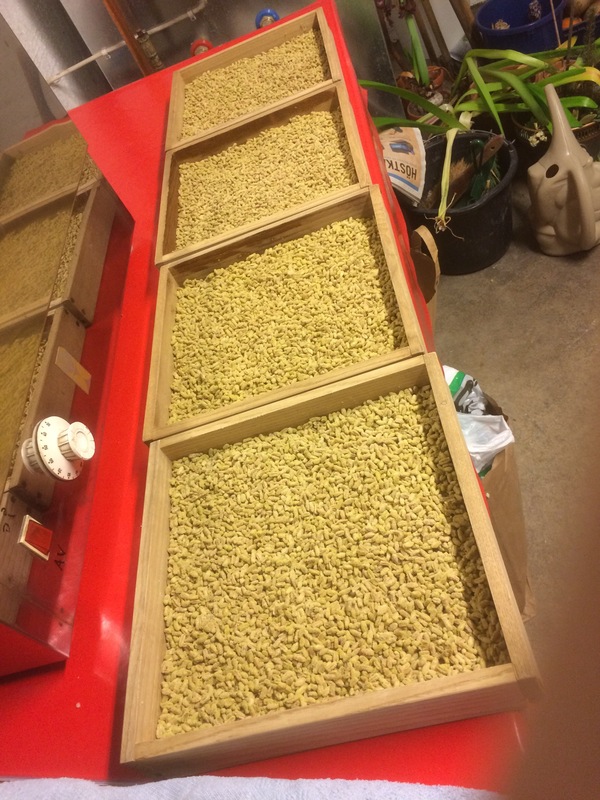 I had to recalculate my standard recepes for 6 month miso and 1 year miso with 200 grams koji as the fix figure. Both fit nicely into 1 liter jars for fermentation. Now for the final ingredient – wait. Now that I have some nice rye koji, I can do some experiments using it. First out is a 2 year rye miso using my standard recipe. 2 years will be a long time to wait, so next week I will have to make some express miso, so that I can get a good taste of it sooner. I will make one more batch of rye koji then a batch or two of rye miso next week. I think I’ll try to make a batch of rye amezake too, to see what that tastes like. The normal koji making is done for this season. Now for an experiment. I’m sure someone, somewhere in the world has tried this before, but it’s going to be a first for me. Rye koji. I’ve always thought this would be difficult or impossible because of the hard shell around the kernal. Then after cooling, innoculating with barley koji starter and incubating, it will be interesting to see what happens. I suspect the rye has not been polished enough. We’ll see.